This week #SundaySupper is celebrating Fall! 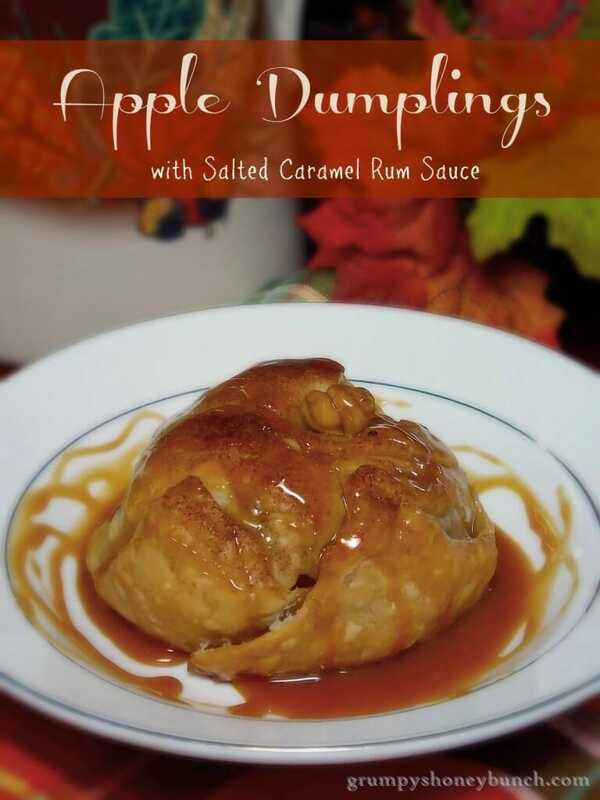 I decided to celebrate with one of my favorite fall desserts, Apple Dumplings with Salted Caramel Rum Sauce. A shout out to our host Coleen of The Redhead Baker and co-host Conni of The Foodie Army Wife! Thank you for hosting Sunday Supper this week! When I think of fall I think of apples and pumpkins. I always look forward to visiting the orchard, even if it is to just buy the apples rather than pick them! Fresh apple cider and apple cider donuts are usually abundant. The beauiful fall colors and the crisp air lend a feel good feeling that I hate to let go of. I normally do not make apple dumplings myself. To me, an apple dumpling is best when made by my brother Steve. 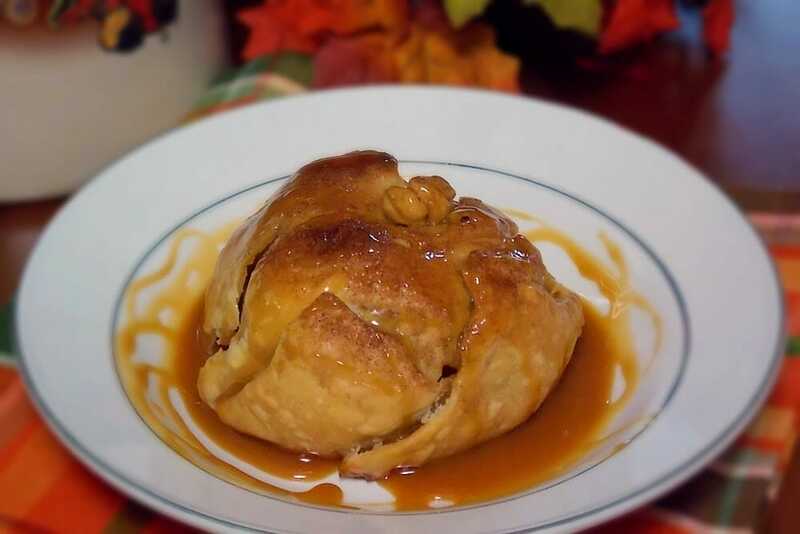 As a matter of fact, until I made this recipe I had not had an apple dumpling since my brother last made them for me. That was back in December 2008! Some things just are not the same when you make them yourself so I really did not attempt to make these like my brother does. Notes about the recipe: This is my easy way out since I hate making pie crust! While I can do it and have done it I prefer not to. That said, I found making these dumplings with prepared pie crust was harder for me. When rolling out the pie dough, do not roll it out too thin. You need your dough to remain thicker to keep the pastry sturdy. As you can see, my dumplings began to fall apart! I suggest you don’t use too large of an apple. I made these twice before I got to the point where I felt the dumpling was presentable as my first batch sunk and fell apart. I believe the kind of apple you use will make a difference. We always used Cortland apples when I made these with Steve. I didn’t have access to a Cortland so went with my favorite eating apple, the Honeycrisp, which may have contributed to some sinking. The Cortland apple is a sturdy apple and doesn’t break down as quickly. Please keep this all in mind if you decide to make this recipe. Preheat oven to 350. Mix together cinnamon and sugar in small bowl. Set aside. Roll out pie dough and cut circle in half. You may need to roll the dough out a little more depending on the size of your apple – if this is the case, please do so before proceeding. Place apple on each half circle in center of dough. Place 1/2 tablespoon butter in center of each apple and top it off with 1 tablespoon of the cinnamon sugar mixture. Use a little more or less sugar depending on the size of your apple – I tend to just try and fill the hole in the center of the apple. Moisten the edges of the pie crust by dipping your fingers in a little cold water and spreading it around the dough round. Wrap your apple in the dough, being careful to seal any seams. If you have enough dough left over you can also cut out some cute little leaves and add a stem to the apple. Place in casserole dish and spray with butter spray. Sprinkle remaining cinnamon sugar mixture on top of the dough. Bake for 1 hour or until crust becomes golden brown. My dumplings sunk a little but still basically held their shape. When ready to serve, place dumpling in serving dish. Microwave caramel sauce for 30 seconds. Stir in 1 tablespoon rum. Drizzle over top of dumpling and serve. Feel free to top with some vanilla ice cream or whipped cream if you feel so inclined! Hi Shelby, I got some dough in my freezer calling for an Apple Dumpling. I've not made them before but I think it'll be worth a try! Pinned! Ohhh I have both apples and rum in my kitchen right now! May need to make these soon. Funny how food is attached to people and good times. 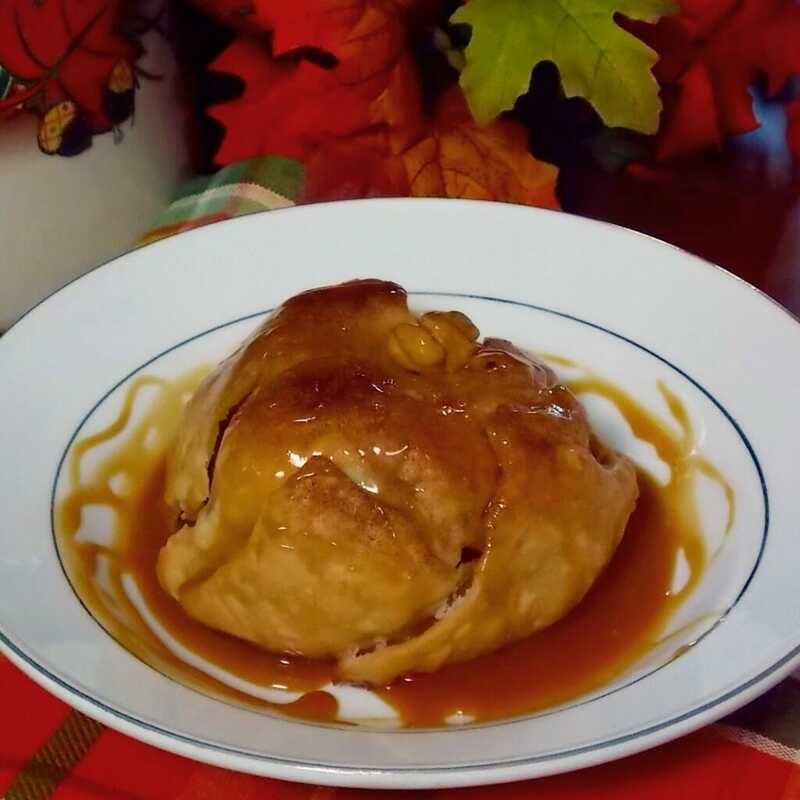 Looks like you did a splendid job replicating the apple dumpling, Shelby =) …I may very well be replicating the recipe soon, too! I love the idea of the caramel rum sauce. I bet it's delicious over the dumplings. Shelby, you sure look like you've been baking these for years! Such a spectacular fall dessert!!! Um, yes? That's all I can say here. This post had me almost licking the screen. SO yummy looking. salted caramel is perfect for fall. A great choice for these apple dumplings! You know me – anything with salted caramel gets my attention! I love fall too! It is so comforting in so many ways – the food, the colors, the weather, the clothes… it's my fave! This recipe looks amazing! Salted caramel rum sauce sounds amazing!! I would eat this with a spoon! Oh wow, these look and sound fabulous!